Overall the process is actually fairly simple - the artwork gets loaded into CorelDraw (oh how we were missing Illustrator) and then you print the design just like any other document. 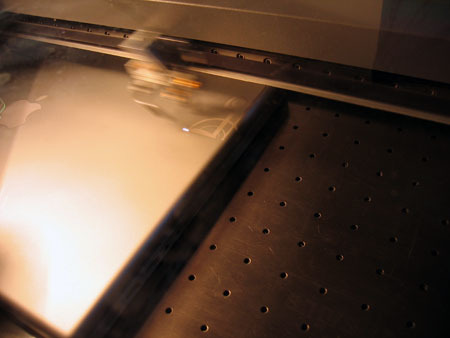 The printer driver allows you to select the settings for the laser engraver such as power, resolution, and dithering modes. 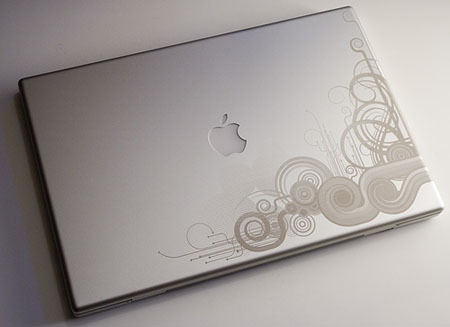 After a test run on paper to ensure everything was lined up properly, we etched directly onto the laptop. The hardest part was picking out and customizing the artwork. It is permanent, and as such the task of choosing artwork made me feel like I was getting a tattoo. Because I earn my living as a Flash Developer and I spend much of my day working on my laptop, the design had to be something I was sure would stand the test of time. For that reason I decided to choose something that had a retro feel, but also a bit organic and edgy. I think that was accomplished with this design, and once the process was finished I felt I had chosen correctly. 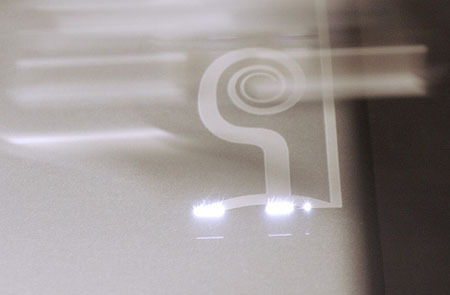 A big thanks to Joe at Engrave here in Portland, Oregon for spending a few hours helping me get everything perfect. Joe posted a few photos we took (including the two above) to his Flickr account last night, and the design is already getting some great feedback. Update 2: Looks like someone posted this to Digg! Also, I've gotten a few emails asking about the artwork. It is an illustration I found on iStockPhoto, which I then put a few hours into customizing. So yes, it is unique, but you can find a similar illustration on iStockPhoto. The Unofficial Apple Weblog has a hilarious post about someone who changed every icon in their OSX doc to match the Adobe CS3 branded icons. A full photo can be found here, and the article (which has some guesses at which icons are for which programs) is located here. For more background on the subject of Adobe's CS3 icons, be sure to check out my prior post. After reading Tom Bray's blog posts about the new Apollo application he has been working on called SearchCoders/Dashboard, I decided to download and give it a try. Within about two minutes of using it I came to the conclusion that this is the most useful Apollo application built to date -- and a few days later I'm still find myself using it regularly to keep up on the FlexCoders email list and relevant RSS feeds. As is the case with any new technology, Apollo users initially created useless projects as they learned the platform and tested all the new abilities it provided. This led to lists such as Mashable's "The 10 Coolest Apollo Apps", which included apps such as DryerFox and FlexTube, with most of the applications not providing any real productivity gain. Sure, they may be fun, but they didn't solve any real world problems or prove that Apollo is a technology that could be sold to a client. SearchCoders/Dashboard is the first I have found to cross over into the useful and commercially viable realm that is needed to ensure its success. SearchCoders/Dashboard can be downloaded here. Rostislav Hristov has a great blog post on five of the most common mistakes users of SWFAddress make, which I have posted about before and use in almost every site/application I build. I believe the post will be helpful because while SWFAddress is an amazing contribution to the open source Flash and Flex community, it isn't all that well documented. The samples provided lay out the code in an easy to learn manner and cover most uses, but there isn't a listing of the methods, how to gain the additional SEO functionality, etc. Rostislav, however, is extremely willing to offer help via the SWFAddress forums or email list. In fact, as soon as I reported a bug in using Google Analytics with SWFAddress he worked with me to solve the problem and patched it up. The issue is that one of the biggest complaints clients have with Flash is that deep linking isn't supported out of the box. This hurts SEO and usability, and thus getting the word out about a project like SWFAddress and making it as usable as possible for beginners is crucial. Complete documentation with the download package could go a long way in making this a reality. Rostislav makes a quick mention of version 1.2 in the post, so here's hoping that the new version also includes some additional documentation. Rostislav -- if resources are an issue, I'd be glad to contribute my time to helping with documentation! AMFPHP, the popular PHP Flash Remoting platform got its original URL mixed up in the whole RegisterFly meltdown fiasco. Thus the old URL of http://www.amfphp.org isn't working and I thought I would help get the word out to instead use http://www.amf-php.org. More information is available on Patrick Mineault's blog. 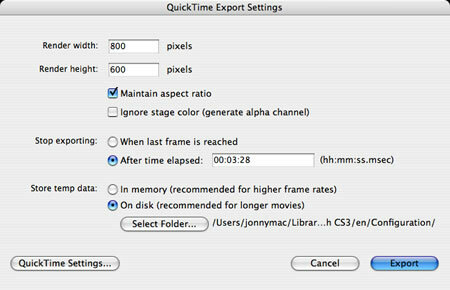 One of the features I am most excited about in Flash CS3 is the full support for exporting to a QuickTime movie. Timelines no longer need to be built specifically for QuickTime export, and you can animate through code, use ActionScript 'til your heart is content, and it all outputs cleanly to a QuickTime MOV file. So if the progress bar freezes while exporting, try changing the setting to "After time elapsed". You can easily get the correct length in seconds by taking the total number of frames and dividing by the frame rate. It may be helpful to note that Flash CS3 itself never froze -- we could always hit the cancel button and it would stop the process immediately. In fact, every system we tested it on had the exact same issue and showed no signs of any processor or memory spiking problems. Hope this helps others who may encounter the same issue!